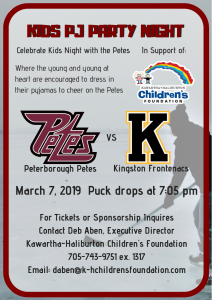 Join us while we cheer on our hometown heroes, the Peterborough Petes, as they take on the Kingston Frontenacs for an exciting night of hockey. $7 from all adult price ticket sales, and $2 from all youth ticket sales goes directly to the Kawartha-Haliburton Children’s Foundation, to send at-risk youth in our community to summer camp, as well as enroll them in activities such as music lessons or sports leagues. Come out for a cause, and show off that footie onesie you got for Christmas.